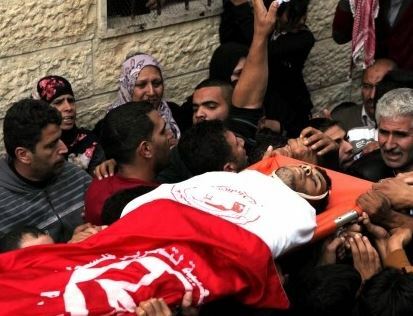 A young Palestinian was shot dead by Israeli forces during clashes in al-Aroub refugee camp north of Hebron, on Tuesday. Additionally, a Palestinian worker was shot dead, at dawn, by an unidentified person, near the Tulkarem district.Sources at al-Mezan hospital told Ma’an News Agency that 21-year-old Mohammad Imad Jawabra was shot in the chest and arrived at the hospital in critical condition. Doctors announced his death shortly afterwards. An Israeli army spokeswoman said a ‘violent riot of 200 Palestinians’ was taking place in the area, while a Palestinian ‘aimed an improvised weapon’ at forces and that soldiers responded by shooting him, ‘confirming a hit’. However, a witness reported to Ma’an that he and Jawabra were drinking tea on the roof of his house when the bullet struck the young man in his chest. sraeli authorities told the PA that Nihad Na’alwa, age 35, from Shweika area near Tulkarim, was killed during theearly morning hours in the Zeimar area, inside the green line, when someone shot him dead. The assailant remains unidentified. Local sources told Ma’an that Israeli forces shot live fire, stun grenades, tear gas, and rubber-coated metal bullets at protesters near the school. The two injured were identified as Ali Naji Hanani and Moayyad Khataya, both aged 16.